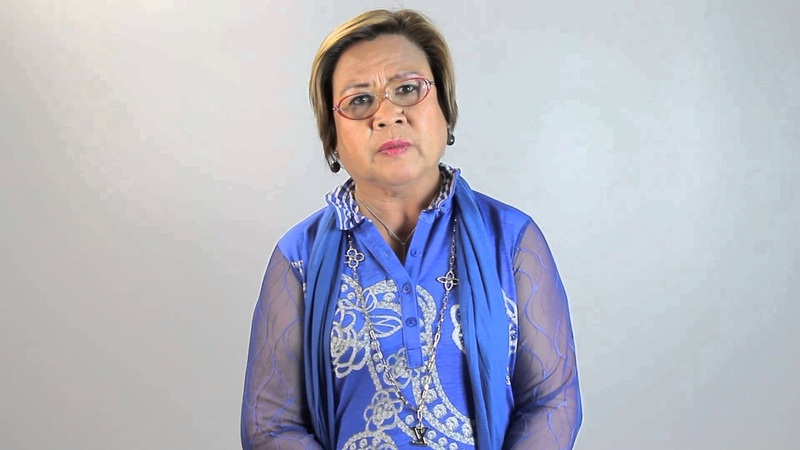 MANILA, April 30 -- Detained Senator Leila De Lima filed a motion for reconsideration before the Quezon City Metropolitan Trial Court (MeTC) seeking to dismiss the disobedience to summons case filed against her by the Department of Justice (DOJ). In her plea filed through counsel Teddy Esteban F. Rigoroso, De Lima asked the Quezon City MeTC Branch 24 to junk the case against her citing "questions on jurisdiction, inconsistencies in the allegation and lack of proper authorization." The camp of the detained senator also pointed the inconsistencies in the amended information or charge sheet filed before the court. It can be recalled that the same argument was raised by De Lima's camp in her petition before the Supreme Court challenging the legality of her arrest and detention involving the drug charges filed against her by the DoJ. "The complaint states 'advising and incuding,' while the information states instructing," the motion reads. De Lima is facing a case for violation of Article 150 of the Revised Penal Code for disobedience to summons issued by the national assembly, its committee or subcommittees. Complainants are House Speaker Pantaleon Alvarez, House Majority Floor Leader Rodolfo Farinas and House Committee on Justice Chairman Reynaldo Umali. The solons, in their complaint noted that De Lima "advised and induce"d her alleged bagman Ronnie P. Dayan, through his daughter Hannah Mae Dayan via SMS, to hide and not appear in the House Inquiry. While in the information filed to the court, Ms. De Lima "instructed" Mr. Dayan. "It is clear from the foregoing that the Information makes it appear that a crime was committed when no clear allegation was made in the complaint itself," the motion further reads. De Lima also pointed out that Messrs. Alvarez, Umali and Fariñas are private complainants who "do not have the authority to sue" the detained senator. "Without an enabling Resoulution by the House of Representatives, the act of the private complainants in filing a case against the accused is simply ultra vires" or beyond their authority,” read the 11-page MR . The next hearing on the case is set on June 9, pending the resolution of the said motion. Alvarez is the prosecution's first witness against De Lima. Aside from Alvarez, Fariñas and Umali are also expected to testify. The DOJ said they also have six other witnesses to testify against the Senator. On the other hand, De Lima's camp has marked as evidence the House of Representative's subpoena, counter affidavit and transcript of stenographic notes of the Congressional hearing. They have no other witness except De Lima. Violation of Article 150 has a penalty of arresto mayor or one month and one day up to six months of imprisonment or a fine ranging from PHP200 to PHP1,000 or both (fine and imprisonment). De Lima was required by Judge Pio-Lim to appear in every court hearing. De Lima, now detained at the PNP custodial center, argued that the allegations against her do not actually constitute sale and trading of illegal drugs and liability of government officials under Republic Act 9165 (Comprehensive Dangerous Drugs Act), but rather only direct bribery. The cases for sale and trading of illegal drugs and liability of government officials under Republic Act 9165 (Comprehensive Dangerous Drugs Act) were assigned to RTC Branch 204 Judge Juanita Guerrero, Branch 205 Judge Amelia Fabros-Corpuz and Branch 206 Judge Patria Manalastas-De Leon. The first case in Branch 204 includes De Lima, Dayan and Ragos. De Lima was joined by her nephew Jose Adrian Dera in the second case in Branch 205.